Alice told Dee that she and Willie would pick her up at the Atlanta Airport, but Dee didn’t believe her! Dee, I think your husband is right, you two do look like Dyan Cannon and Amy Irving!Â Right out of “Honeysuckle Rose.”Â When you two were still friends, before Amy went on tour with Buck. This entry was posted on Wednesday, August 22nd, 2007 at 8:15 pm and is filed under Fans, Photographs. You can follow any responses to this entry through the RSS 2.0 feed. You can leave a response, or trackback from your own site. Well, I must say that Dee is minimizing all this situation! 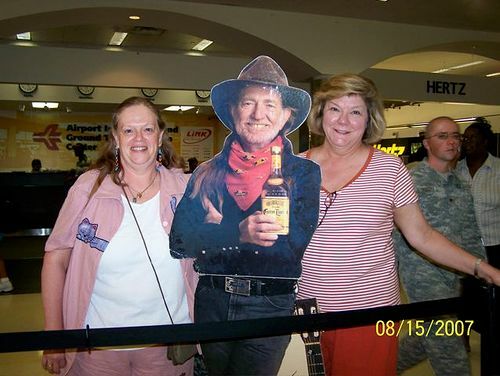 Do you know how much trouble it was to get clearance for me to bring â€œTravelinâ€™ Willieâ€ into the Atlanta Airport??? I think we have some Willie Admirers here in Atlanta!! and, Marion, I DO NOT think we look like Dyan and Amy…. We are definitely Thelma and Louise!!!! Movie stars, none the less!